(October 13, Melbourne, Sri Lanka Guardian) As we all know that the Bundala wetland is being invaded by Cactus (Katu Pathok), Suddha plant has been invading Central Mountain Regions including Knuckles and Horton Plains, Parthenium is a big headache for farmers in Vavuniya, Embilipitiya area. Salvinia and water hyacinth plants are chocking our irrigation canals, tanks and reservoirs in Anuradhapura area. Katu Andara has been a problem in Hambantota lagoon and surrounding areas. Youda Nidikumba emerged from Mahaweli River bank in Kundasale and marching to Colombo area showing its spreading ability. Can you close your eyes and do nothing about those problems? Do you like to hear about another invader recently I found in Sri Lanka. Fortunately I don’t like to leave my eyes closed when I see something bad to our environment in Sri Lanka and I like to share my findings with our public. That is how you could educate people on these issues and get their attention to do something to assess the situation and manage them in a correct way. My recent visit to Sri Lanka in September found another invader completely smothering our valuable riparian areas, wetlands and water streams and canals in our beautiful Nuwara Eliya area. As we know Nuwara Eliya situated about 1868 m above the sea level in Central Mountain Region of Sri Lanka. 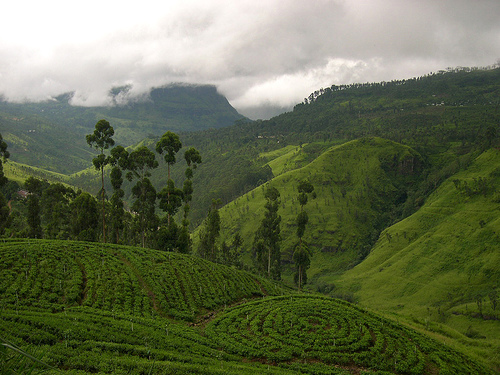 Pidurutalagala – the highest mountain of the country also at close proximity to Nuwara Eliya. It has wet, cold climate and blessing with range of water resources. Samuel Barker an Englishman was the pioneer of this place during British ruling time. This place used to be a “paradise” to English planters and government servants for hunting, fishing, golf playing and other recreational activities. So Nuwara Eliya was named as a “little England” at that time. When I was entering into this beautiful township via Nuwara Eliya –Hatton road, I was amazed to see one unusual plant growing along the road and surrounding wet areas covering whole area as well as all other plants. The plants were blooming with white-pink coloured flowers. I stopped my vehicle and inspected the plant more closely. I checked its characters such as leaves, stems, flowers and root system. Then I managed to identify the plant as one of the highly invasive alien plant species commonly named as HIMALAYAN KNOTWEED. Local people named this plant as “Ambul Gata” (sour knot) due to its sour taste when they eat soft unfold leaves. Then I wanted to see its behaviour and distribution in and around Nuwara Eliya area as I knew it’s characters and problems created in other countries like United Kingdom, USA, Europe under similar climatic conditions to Nuwara Eliya region. I found that the plant is being spread through all roads entering to Nuwara Eliya township. I saw a very large infestation growing towards to tea plantation at the Nuwara Eliya – Gampola road just few km’s away from Nuwara Eliya town. Other large infestations were located near Ambewela at Ambewela – Horton Plains road. That was a danger sign as water is the key factor for propagation of this plant species. Thus relevant officials should be keep an eye on the movement of Himalayan Knotweed in this area. 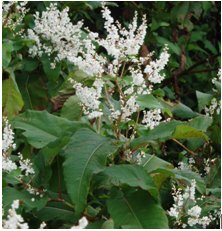 The botanical name of the plant is PERSICARIA WALLICHII (POLIGONUM WALLICHII). The plant was originated in Hamalayan mountain region of India and distributed as an ornamental plant species in United Kingdom, Ireland, Northern states of USA, Europe and New Zealand. Several years after it’s introduction to those countries, they realized the invasiveness of this plant as it was spreading very vigorously covering all other native plant species in absorbing available moisture in the area. After assessing all relevant risks characters of Himalayan knotweed, they declared it as a “noxious plant” in their country or state. Himalayan Knotweed is a perennial plant growing erect up to 1-3 meters tall from creeping rhizome. The stem has several segments joint together like a bamboo plant stem with branching. The stem is hollow (hole inside) and reddish brown in colour and hairy. Stipules are fused around the stem to form sheaths that are red-brown. Leaves are lanceolate, light green colour, 9-22 cm long, 2.8 – 7.8 cm wide, containing slight hairs on both sides. Leaf petioles are 3-20 mm long. Leaves are arranged alternatively on stems. Flowers are produced at the end of branches in clusters. They have white or pinkish petals which are oblong to obovate in shape. Flowering occurs from August to October each year. After pollination, flowers produced seeds. Seeds are brown, 2.1 – 2.5 mm long and 1.3 to 1.8 mm wide. Main aggressive feature of this plant is it’s underground rhizome system. They can grow up to 3 m deep and 5-7 m wide in the soil. The horizontical rhizomes can produce large number of shoots around the mother plant and forms dense stands. Very small piece of rhizome (about 1 inch) could be developed to a huge stand of Himalayan Knotweed. I have seen this plant has been invading some places in Ambewela area smothering homes. I am sure this plant could be a big disaster in cooler climatic regions in sri Lanka specially in Nuwara Eliya district. Piece of rhizome can spread through water around the area even further away from Nuwara Eliya area. I do hope that relevant authorities would consider this plant species very carefully and try to do proper survey and assessment in Nuwara Eliya district and do something to stop it’s invasion. Once established this plant it grows into extremely dense stands that out compete all native vegetations. This species has large leaves and produce thick foliage, which out-shades underlying vegetation. 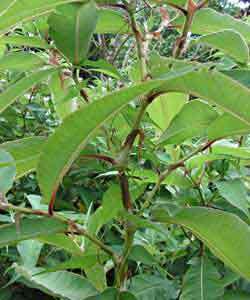 Himalayan Knotweed reduces the availability of nutrient in the soil. It competes with trees and can reduce shade along rivers and streams by displacing native woody species. Infestations produce dense mats of leaf litter that prevent the germination of native species. Please don’t think that all aliens are invasive. But we have to have some policies and guidelines to assess their risks and threats they can pose to a new environment. Even though Sri Lanka is a small country we have different climatic conditions due to the landscape of the country. Thus we can expect a huge range of invasive species in our country under different climatic conditions. We have to identify them properly and assess their risk and treat them accordingly.